What is the Feasibility Estimation Sheet Template? 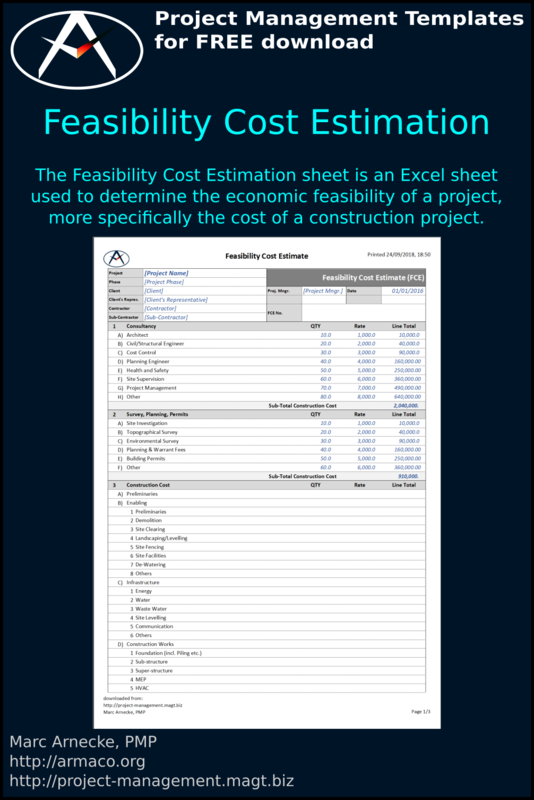 The Feasibility Cost Estimation sheet is an Excel sheet used to determine the economic feasibility of a project, more specifically the cost of a construction project. How to do Feasibility Studies? A feasibility estimate is used for determining the economic viability of a project, the probable sequence and cost for construction, and serves as a guide in the choice between alternative locations or plans. Since you are on this web page you are obviously interested in doing feasibility studies. Professional estimators use defined techniques to create cost estimates that are used to assess the financial feasibility of projects, to budget for project costs, and to monitor project spending. An accurate cost estimate is critical for deciding whether to take on a project, for determining a project’s eventual scope, and for ensuring that projects remain financially feasible and avoid cost overruns. Cost estimates are typically revised and updated as the project’s scope becomes more precise and as project risks are realized — as the Project Management Body of Knowledge (PMBOK®) notes, cost estimating is an iterative process. A cost estimate may also be used to prepare a project cost baseline, which is the milestone-based point of comparison for assessing a project’s actual cost performance. Cost estimates are critical to successful project management, so teams are expected to produce a reasonably accurate and reliable estimate during the conception and definition phase of a project. Estimates are adjusted for accuracy during the planning phase, as project stakeholders and sponsors may ask for revisions before they are willing to authorize a budget. After this early stage, the accuracy of estimates is systematically increased. Cost estimating is an ongoing process, and estimate revisions are normal in order to ensure accuracy throughout project execution. Typically, work scheduled in the near future will have the most accurate estimates, while work scheduled farther away in time have less accurate estimates. This approach is known as rolling wave planning.